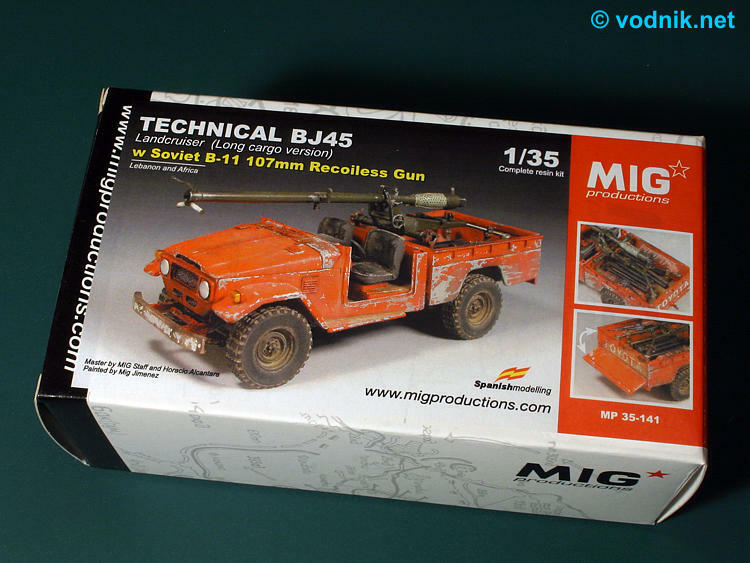 The latest, fourth, kit in the MIG Technical Landcruisers series is longer BJ45 version with Soviet B-11 recoilless rifle. 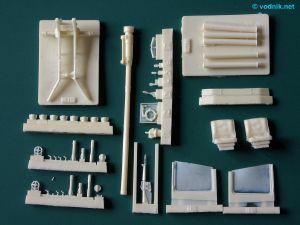 Previous three releases were various versions of shorter BJ44 variant in which the cab and the cargo compartment are one structure. In BJ45 Landcruiser the cargo compartment is separate from the cab. 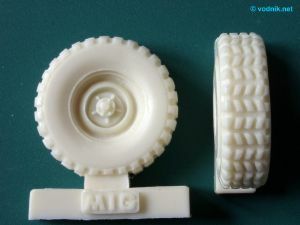 The car in new MIG set is depicted in configuration without doors and windshield and with new wider and larger wheels with "all terrain" tread pattern. New Landcruiser does not have front winch, which was included in two of earlier kits. Small note on the box label says "Lebanon and Africa" suggesting where vehicles in such configuration could have been used. On the instruction sheet is a short quote from the "Battleground Lebanon" book by Sigalit Katz (Concord Publications) in which the use of Soviet B-11 weapon by Palestinian guerillas in Lebanon is described. The set comes in a MIG standard cardboard box with a few photos of finished model (painted by Miguel Jimenez) on the label. 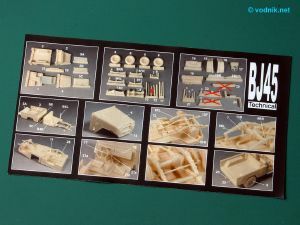 Inside the box are four plastic zip bags with cream colored resin parts and a small instruction sheet printed in full color with a series of photos identifying part numbers and showing the assembly sequence. 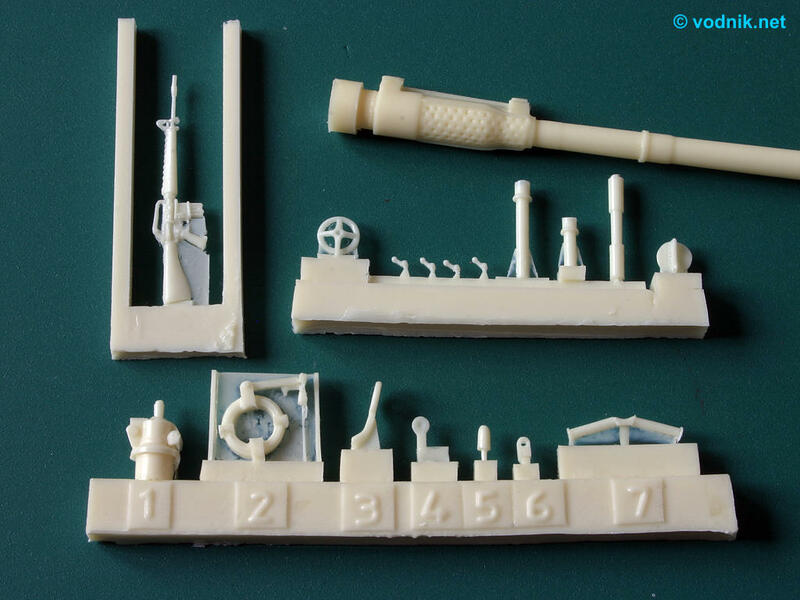 Unfortunately cream resin parts are not clearly visible on photos - particularly locations of some tiny parts for recoilless rifle are not quite clear. Photos of painted model on the box provide some help however to assemble the kit properly. 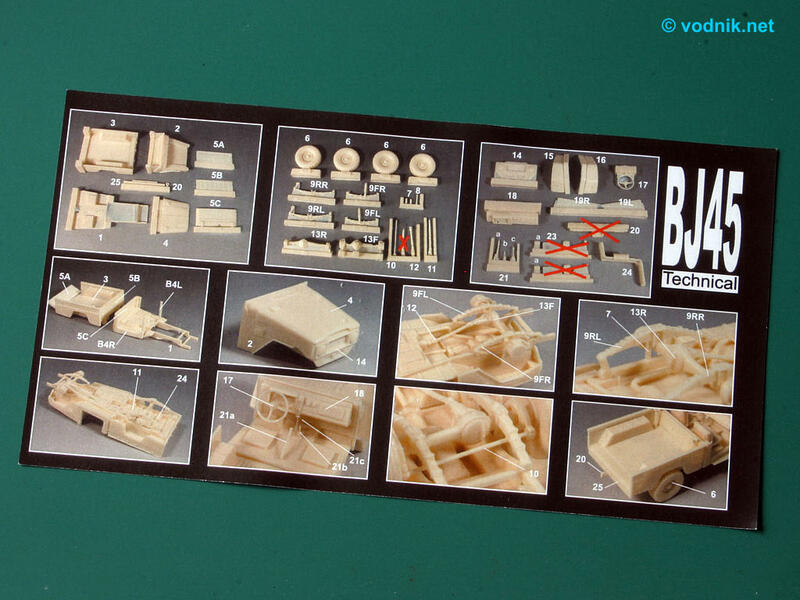 In the set we get of 92 resin parts, but as many parts and even one entire zip-bag of parts are shared in al Landcruiser kits, we get some extra parts not needed in BJ45 kit. There are 8 such parts, so actual kit is comprised of 84 parts. 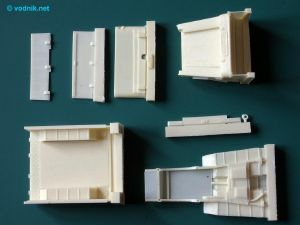 General layout of kit parts is the same as in previously reviewed BJ44 kit (link to BJ44 review) with the rear part of frame cast integrally with the rear cargo bed part, and the front integral with cab floor. Most suspension components are the same as in BJ44 kit with only one longer drive shaft being a new part. New al terrain wheels look excellent and should give this Landcruiser much more aggressive look. 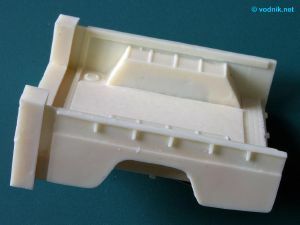 The entire front of the car is composed of all the same parts as in BJ44 model, but in addition to previously used parts we also get the back cab wall. (Well... I mean we are supposed to get it... In my set this one part was missing and instead I got a back wall of BJ44 car - unfortunately this part is useless for BJ45. One e-mail sent to MIG Productions and a few days later I've found an envelope with correct part in my mailbox!) 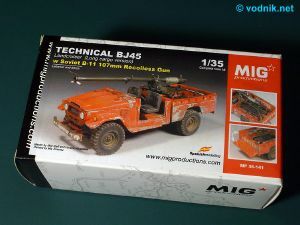 The front bumper is similar to the one included in BJ44 set, but this time there is no winch attached to it. Inside the cab all parts are the same as in earlier kits. Unlike in BJ44 kit the cargo compartment has a front wall, independent from cab wall. The tailgate can be attached open or closed. 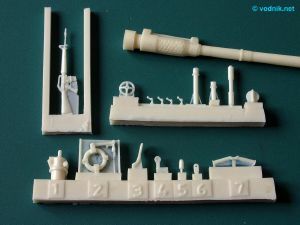 The B-11 recoilless rifle is very detailed with lots of tiny parts. The weapon and mount is composed of 34 resin parts. I already mentioned that assembly is slightly complicated by the fact that photos in instructions are not quite clear, but with the help of color photos of finished model on the box it should be doable. The weapon is provided with the entire base, which in standard configuration can have wheels attached to it for towing the weapon, but here is mounted on the cargo bed. 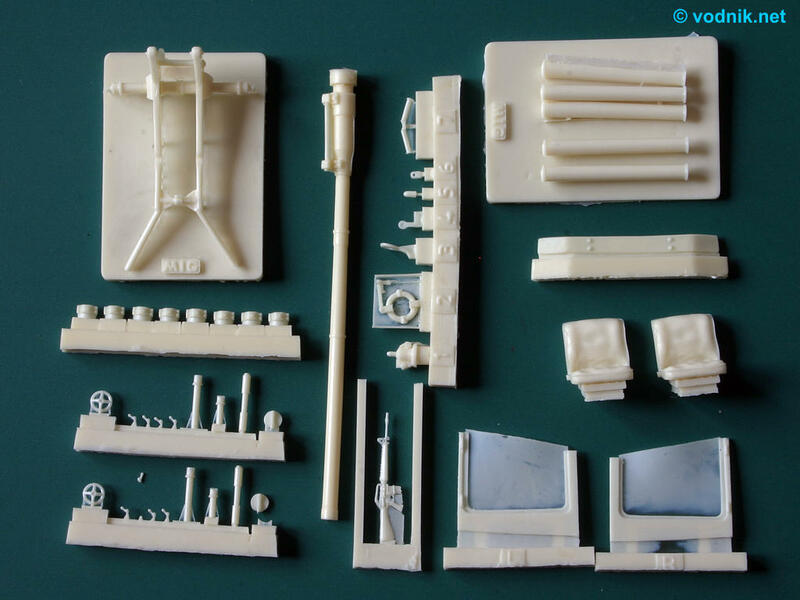 Some extra parts are provided to add to cargo compartment: M16 rifle and five tubular recoilless gun ammo containers. Click on picture to enlarge it. 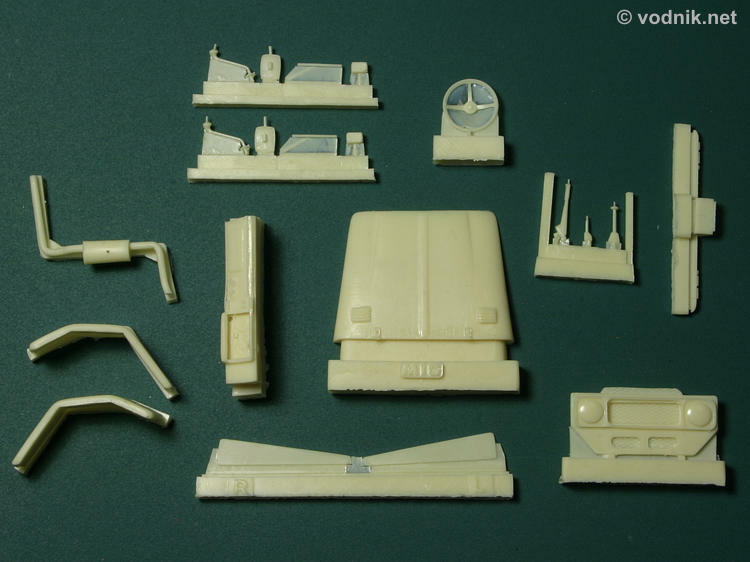 Contents of the first zip bag: main cab, cargo bed & chassis parts. 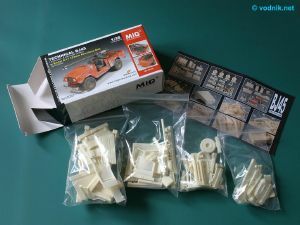 Contents of the second zip bag: wheels, axles, leaf springs and drive shafts. Only wheels and long shaft are new parts, others come from BJ44 kit. Click on picture to enlarge it. Contents of the third zip bag: recoilless rifle parts, M16 assault rifle, seats and other parts. 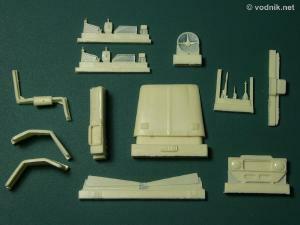 Contents of the fourth zip bag: engine hood, grille, fenders, dashboard and some other parts. All these parts are identical as those in BJ44 kit. Parts are cleanly cast with no air bubbles in my set. There is some amount of flash on parts, but nothing serious. 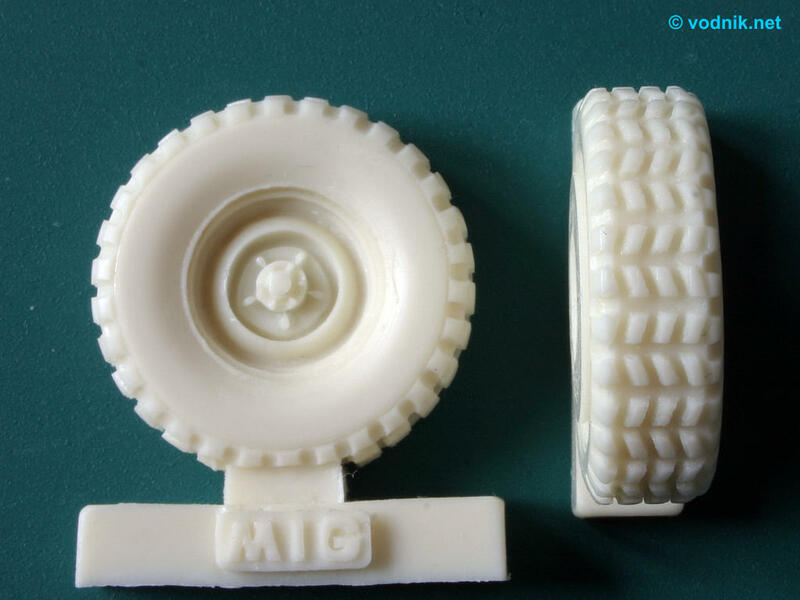 Easy to remove resin film is added to some of parts to facilitate casting. Resin parts are attached to casting blocks, but areas of contact of parts and blocks are kept to minimum, so cleanup should be easy. In my set the recoilless gun barrel is noticeably warped, but I hope is should be correctable after dipping the part in hot water. Some other parts like tailgate and cargo bed front wall are warped as well, but these should be even easier to fix. Nice crisp details are cast on parts and I personally like new wheels very much. Close-up of M16 rifle and some of recoilless gun parts. Click on picture to enlarge it. New all-terrain wheels. 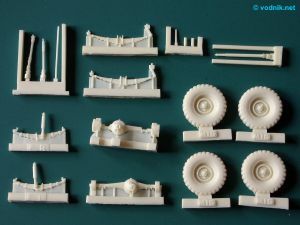 Accuracy of the Landcruiser model is probably not very important for most modelers - after all this is not product addressed for civilian car modelers, but for military modelers and for those in this case it is only important that it looks like civilian pick-up truck - or technical car. Some inaccuracies I mentioned in review of earlier kit are still present here, like inaccurate dashboard, however one inaccuracy has disappeared as now the fuel filler cap, missing from previous kit, is present on the new rear cab wall part. I also believe that the shape of rear fenders is not quite correct, as cutouts are rather trapezoidal in the model, while all photos I found show much more round contour. More important would be checking if B-11 recoilless rifle is properly depicted, but unfortunately I was not able to find any reference photos of it on the Web... I only found one sketch of this weapon and the MIG part looks every bit as the thing on that drawing, so I assume that it is at least generally accurate.